WattsOn is an application for energy supply contract management ie. bilateral agreements that managed the delivery of energy to the sites of the customers. WattsOn accompanies you throughout the life cycle of your contract. WattsOn offers Large customers a fine tuning of their energy contract, with a large portfolio of automated processes (invoicing, forecasting, and price risk management). Customer can access all customizable features through web portal to get a quickly overview or deep information on consumptions, bills or contract managements. 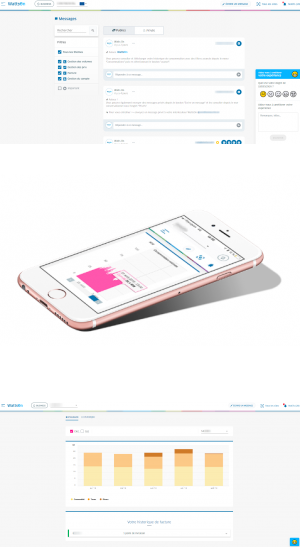 WattsOn offers internally a dedicated space federating the different business actors responsible for the management of price and volume risk, thus guaranteeing customers the most attractive supply price possible and simplifying contract management up to invoicing. Parallelly, only specificities of “full supply” are managed through WattsOn, all market risks are on trading responsibilities. 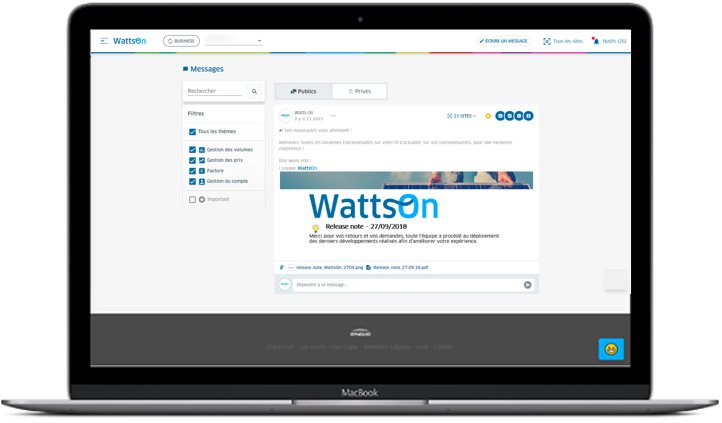 WattsOn offers a seamless experience to all its customers and internal users, regardless of their locations (now France and Czech Republic, and in the future Belgium, Holland, Italy, Spain and Germany) and products. WattsOn is developped on a solid foundation with reliable data to be scalable tool and aligned with your needs. Your collaborative messaging tool is focused on team conversations. You can chat privately with one person. The main idea is to establish communication channels ("themes") to interact simultaneously with several colleagues. The Focus Tool allows you to select the site you are interest in. It intuitively filters all other tools (invoices, Wall, consumption). You can identify and select one or more sites. Consult your volumes in 2 clicks, according to the site chosen in the Focus Tool. Get a sites daily view. View your detailed billing data. Upload your bills and see your history. Monitor your sites daily, using a system of tasks. - Enjoy real time progress. - Assign a task to your colleagues. Manage your account and complete your information on a daily basis.